Mario knows quality meats. 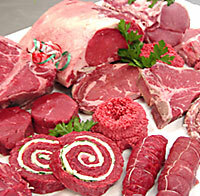 Not only does he know how to choose the best cuts of meat, but he even has some excellent cooking tips. These are the cooking tips from Mama and how she prepared the family dinners. So we are pleased to share them with you! 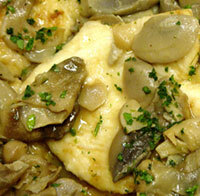 Chicken Breast: Marinate chicken breast in balsamic vinegar, olive oil, salt, and pepper. Bake in pre-heated 350 degree oven for 30 minutes. Or dip chicken breast in olive oil, then seasoned breadcrumbs. Bake in a pre-heated 350 degree oven for 30 minutes. Pork and Beef Bracioles: sauté in olive oil and fresh garlic, until evenly browned. Add crushed Italian plum tomatoes, salt, pepper, and basil. Simmer for 1-½ hours. Pork Tenderloin: sauté garlic in olive oil in pan until brown. Slice pork tenderloin to approximately 3/4″. Brown in pan with garlic and olive oil. Add Italian tomatoes, salt and pepper. Simmer for 20 minutes. Serve with your favorite pasta. Boneless Loin of Pork: season roast with salt, garlic, and black pepper. Add ¼” water in pan. Cover with aluminum foil and roast for 30-35 minutes per pound at 350 degrees. London Broil: marinate in lemon juice, olive oil, and herbs. Broil for 15 minutes. Turn, broil for 15 minutes on the other side for medium rare. Pork Chops: dip in olive oil and toss in seasoned breadcrumbs. Place in aluminum pan and broil for 14-16 minutes. Or; sauté in pan with olive oil and garlic until evenly browned. Add Italian tomatoes. Simmer for 20 minutes. Stuffed Chicken Breast: place stuffed chicken breast in baking pan and cover with aluminum foil. Place pan in a pre-heated 350 degrees oven for 20 minutes. Uncover, and cook for another 10 minutes. Pepper Steak: sauté beef and garlic for 8 minutes. Add sliced peppers and onions, and continue to sauté for an additional 3-5 minutes. Add tomato sauce and a dash of wine (if desired). Simmer these quality meats for 15-20 minutes and serve over rice. Veal Cutlets: heat olive oil and butter in a pan. Dip both sides of veal in seasoned flour. Sauté until lightly brown on both sides. Drizzle with lemon juice. Or dip each cutlet on both sides in egg, then in seasoned breadcrumbs. Heat olive oil and butter over medium heat cook veal until brown and crisp on both sides. Pork Steaks: brush steaks with olive oil, dip in seasoned breadcrumbs. Place on baking pan. Bake at 350 degrees for 30 minutes. Pinwheel Steaks: place steaks on baking pan, broil for 4 minutes, turn steak broil for additional 4 minutes. Stew: toss desired meat in flour. Heat small amount of oil in pot, brown meat and sliced onions together. Add white wine, carrots, celery, and vegetable of your choice. Then, add chicken stock and can of tomatoes. Simmer for 1-½ hours. Baby Back Ribs: place ribs in pan, cover with half parts water and orange juice. Cover with aluminum foil. Bake at 350 degrees oven for 1 hour. Then, uncover foil, drain liquid, and brush with barbeque sauce. Bake these quality meats uncovered for additional 30 minutes. Porchetta or Pork Loin Roast: (Pre-heated oven 350) Requires approx. 20 minutes per pound or the internal temperature reaches 155 degrees. Beef Tenderloin Roast: (Pre-heated oven 375) Requires approx. 45 minutes or the internal temperature reaches 140 degrees for rare, 150 for medium. 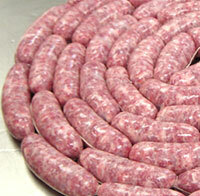 Sausage: can be baked in the oven at 350 degrees with potatoes and onions for approximately 1 hour. Or pan brown sausage in a small amount of water. When water evaporates, add oil. Then, add cut up peppers and sliced onions. Cook until veggies are tender and sausage is cooked through. Veal Roast: (Pre-heated oven 350) Requires approx. 20 minutes per pound or the internal temperature reaches 140 degrees. Rib Roast: (Pre-heated oven 375) Requires approx. 20 minutes per pound or internal temperature reaches 140 degrees for rare, or 150 degrees for medium. Lamb Roast (leg of lamb roast): (Pre-heated oven 350) Requires approx. 20 minutes per pound or internal temperature reaches 160 degrees. Rack of Lamb: (Pre-heated oven 375) Requires approx. 40 minutes or the internal temperature reaches 160 degrees.